Have you ever seen a dog take a bow on cue? It's pretty adorable. Dogs enjoy tricks because they get lots of positive attention. If you can train it to sit and stay, you can easily train your dog to take a bow on command. 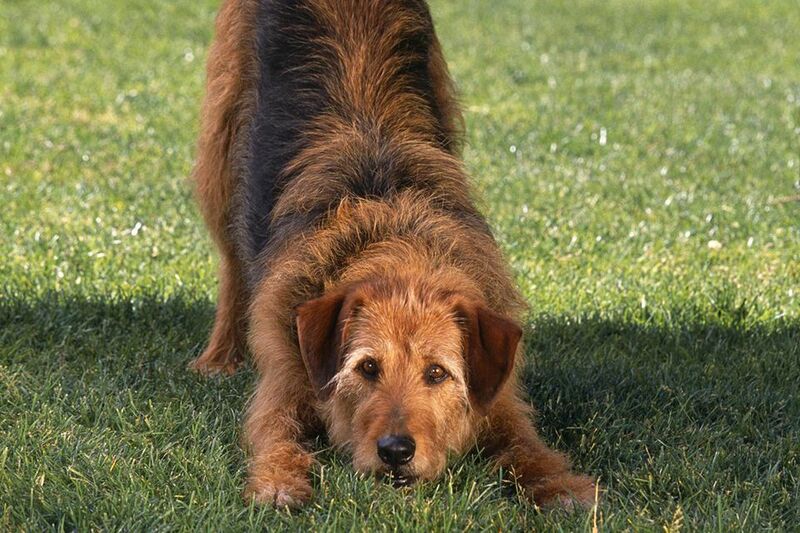 To take a bow, your dog leans down with its "elbows" and chest touching the ground while its rear end stays up. This is the perfect finishing touch when showing off all your dog's tricks. All you need to train a dog to take a bow is your dog and some treats. You may also want to have a clicker on hand if you are using clicker training as part of your dog training. Start with your dog standing up on all four feet. It's helpful if your dog is able to stand on command. If it hasn't mastered this basic command yet, you may want to work on it before moving on to the second step. Hold a treat at the tip of your dog's nose, and slowly move it down, holding it close to your dog's body. In this way, you will use the treat to lure your dog down until its elbows are on the floor with its hindquarters remaining up. Hold your dog in the bow for a few seconds, and then use the treat to lure it back into a standing position. As soon as your dog completes the bow and is standing up, say "yes" or "good" or click your clicker, and give the dog the treat. Repeat this process several times. Once your dog seems to understand the action, you can add the cue word "bow" before going through steps 2 and 3 again. Practice the bow command with your dog several times a day for no more than 5 minutes each time. Before you know it, your dog will be taking a bow on command. Some dogs have a difficult time learning this entire dog trick all at once. If this is the case with your dog, you can teach it to take a bow in smaller increments. This is called shaping a behavior, and works really well with clicker training. To do it, you need to begin rewarding your dog for moving in the right direction. For instance, if the best your dog can do in the beginning before making mistakes is to follow the treat halfway to the floor, click and treat for that. Then start to give treats only when your dog is closer to the floor. This is how you will be able to select the behaviors that come closest to what you need the dog to do. In small increments over several training sessions, you can slowly train your dog to take a bow. Training your dog to do any new trick takes patience, for you and the dog. If your dog seems to be losing interest in your training session, it's time to call it a day and try again tomorrow. And never strike your dog or yell at it when trying to train it in a new trick. You'll only confuse your pet. Remember to be patient with yourself and your dog while training. All dogs learn differently. Keep training sessions short and upbeat, and be sure to end on a positive note. This may mean giving the dog a command it already knows well and offering effusive praise and a treat at the end. Some dogs have trouble keeping their rear ends in the air when initially learning this trick. To keep its back half up while its chest and elbows are resting on the floor, place your arm underneath the dog's stomach while you use the other hand to lure its front half to the floor. Most dogs will quickly catch on, especially if they know other tricks already, and after a few practice sessions, your dog will take a bow without you having to hold its back end up. You'll know the trick is "proofed" when the dog performs it in any environment.